I can’t believe I haven’t written about The Go-Betweens in the nearly eight years of this blog. For many years I thought that I first heard of them when the video for “Spring Rain” was a staple of the early days of MTV’s “120 Minutes.” It was after seeing that video that I saw the import UK CD of “Liberty Belle + The Black Diamond Express” in the bins at Murmur Records as one of the CDs that had begun trickling into the former vinyl enclave by 1986. I bought the CD and immediately took a shine to its literate and richly emotional pop music. This was the first Go-Betweens album I can remember ever seeing. I stayed with The Go-Betweens for their next two albums from their fertile middle period. I assumed that this Oz band had hits at home since they seemed to have no problem getting US licensing on US labels like Capitol subsidiary Big Time, which was home to many other fine OZ bands as well as UK and US indie groups that certainly passed muster. Their “Tallulah” album of 1987 introduced a fifth member to the groups lineup, Amanda Brown, who played oboe and violin as well as sang BVs. When I heard “Bye Bye Pride” I knew that I had just heard the pinnacle of finely etched, heartbreakingly gorgeous, pop music. When the next years brought the album “16 Lover’s Lane” it was a quick purchase as the band seemed to be honing their art to something even more direct and heartfelt. Then, in the pre-internet world of 1989, The Go-Betweens seemed to simply evaporate, and there were no further CDs to buy. As we entered the cruel 90s, I would have preferred that there had still been The Go-Betweens to dive into when all around was lost. It was sometime in 1999, I think, that my wife had heard a song called “Lee Remick” on WPRK-FM college radio and had mentioned it to me. I soon discovered that it was by The Go-Betweens and dated back to the band’s roots in the late 70s. I had no idea they had such a broad legacy, since they weren’t even a blip on my cultural radar until I had seen that “Spring Rain” clip. But I did not dig deeply into it. I assumed there had been a compilation with early material but I never saw it. Last month my wife brought home the DVD she’d ordered for the library where she works of “The Go-Betweens: Right Here.” We watched it and I was amazed at the story of the band which was fraught with enough ache and heartbreak to have inspired at least a dozen of the songs of Grant McLennan and Robert Forster; the pair who had met in college and had formed the core unit. Their recording of that indie 7″ of “Lee Remick” back in 1978 had seen the band grow to the quartet they were whenI first heard them. Which, if you absolutely needed to own, you should be prepared to part with a serious three to four figures for 40 years later. The band released several indie 7″ers in Australia that saw them attract the attention of Berserkley Records, who made an offer but went bust before anything could come of it. The band had left their native Brisbane in search of a deal in the UK and tried to engage Rough Trade to no avail. Then they linked up with Orange Juice, who issued their third single “I Need Two Heads” on the über hip Postcard label. This proved to be their calling card as they now found themselves with a deal with Rough Trade only after they received the blessings of Orange Juice. All of this was news to me in 2018. Which is why as a casual fan I was fascinated by this film. The lineup began to gel further after they returned to Brisbane and added drummer Lindy Morrison to the band because Robert Forster thought that the best bands had a mixture of men and women in the lineup. Or it could have been because he took a fancy to the outgoing Morrison, who was drumming in Xero, Brisbane’s New Wave hotbed. This saw Morrison and Forster becoming a couple for several years. I honestly had no idea. The band had two albums that I never saw in the bins, but their fourth one, “Spring Hill Fair” now featured Robert Vickers on bass and watching this film and seeing the video clip of “Bachelor Kisses” reminded me that this was actually the first Go-Betweens I had heard. This was the clip on the early “120 Minutes” airings, not “Spring Rain.” I certainly recall being taken with it now. But I never saw any Go-Betweens albums at the time. I didn’t even recognize the name of the corresponding “Spring Hill Fair.” Which was their sole release on Sire Records. Drummer Morrison had an amusing anecdote where Sire honcho Seymour Stein wined and dined the band while regaling them with tales of his Life In The Industry. The astute Morrison told her bandmates later “that’s the last time we’ll see that guy.” And of course she was right. Between the pinched and reticent Forster and the no-holds-barred Morrison, the push and pull of the band mirrored the roiling sea beneath them as by the time that Amanda Brown joined in 1987, Forster and Morrison had split up but Brown and Grant McLennan had become a couple. It was like Fleetwood Mac … only with [much] better songs! The telling of the tale was complicated by the sudden death of McLennan by a heart attack in 2006 at the age of of 48. Fortunately, he remains in the film via all of the footage in the can with him. Forster seemed a mixture of pride and regret as the band had never logged what could be called a hit single anywhere in the world, much to my surprise. They had a tumultuous ten year rollercoaster before Forster convinced McLennan that they needed to dump the women and make a record as a duo. Once this was mentioned, Amanda Brown packed and left McLennan right then and there, leaving him stunned and turning to heroin for a partner. All the worse for his friend Steve Kilbey of The Church who came along for the ride. The rich music cojoined with the various interpersonal politics of the band was a great canvas upon which to paint this film, and director Stenders has made a beautiful film that prefers poetry to fast-cut action. Stenders past with the band [he directed the music video for “Streets Of Your Town”] probably held him in good stead with them. If the absent McLennan and the reluctant Forster [watching his constrained body English and arid expressions suggests the least likely pop star ever] were the twin suns of The Go-Betweens, then Lindy Morrison was certainly the moon that kept it all in balance. To this day she does not mince words and her scenes both with and without Amanda Brown [with whom she formed a band after The Go-Betweens called Cleopatra Wong] dredge up all of the pain and discontent just below the surface of it all. It made for fascinating watching. And as it all unfolded there were those wonderful songs filing my mind in its every waking moment. Afterward, I hit my Go-Betweens albums pretty hard; discovering that I had bought a copy of Forster and McLennan’s 2001 reformation album “The Friends Of Rachel Worth” several yeas ago and I had not yet listened to it! I need copies [now on CD] of their first three and last two albums. 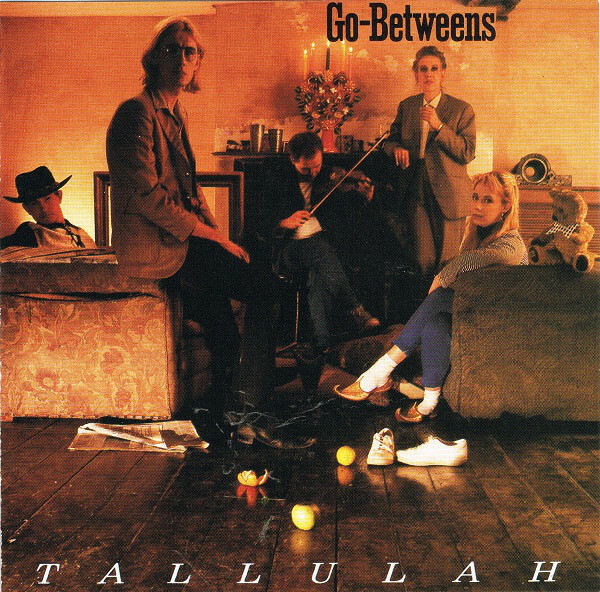 There was recently volume one of a Go-Betweens BSOG which deserves another mention later, since it will set you back three big ones already. 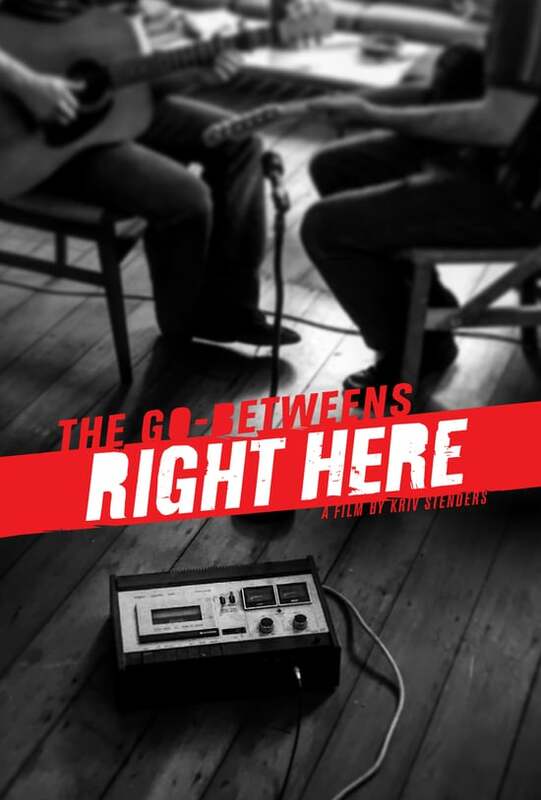 In the interim, “The Go-Betweens Right Here” is currently out as a Region 4 DVD. This is why we have a region-free, standards converting DVD player, and here’s the trailer below. This entry was posted in DVD, film and tagged 2017, Documentary, Go-Betweens. Bookmark the permalink. Thanks for the reminder! Ordered immediately. I recommend Robert Forster’s, Grant and I, a great read. SimonH – Yes, Forster’s book as joined my long list of books for my wife to get me. You see, she’s in charge of interlibrary loan at the college where she works… [steeples fingers] Except that right now my wife has already gotten me the next 3-4 books I’m due to read once I get out of the psychic mire that is Michelle Alexander’s “The New Jim Crow.” Not there’s a book to take the spring remaining out of your step! Then there’s the books that I have added to the library last year still awaiting. I’m ashamed at how little I read at the moment! Grant and I is one of those you will demolish in a couple of days. Love this band and have all the releases save for “G Stands For Go-Betweens (Vol. 1)”. I kick myself now for not buying it at the time but I just wanted the CDs and not any vinyl and now the price is astronomical. I’ve known about the DVD for awhile but can’t play a region 4 DVD in anything but my computer. KeithC – I had no idea that “G Stands For Go-Betweens [vol. 1]” even existed but I also would have passed due to the insane mix of LPs of albums and CDs of bonus material paradigm they went for. Not to mention the pre-sale price, which was astronomical enough! Now? My hair ignites thinking of a $650 price for it just three years later. Maybe I should be saving up for vols. 2 + 3 just to have something nice to retire on? Put my retirement literally into CDs. Too true re the retirement; I use that excuse when my wife calcs what I spent on CDs. I used to show her select items in my Discogs list (such as my $340ish Telex CD box set) but she figured out that nothing was ever on the For Sale list. The interesting thing about that Go-Betweens Box set was the inclusion of a random book from McLennan’s personal library (supposedly selected by Forster himself). I converse with a few guys on The Church’s forum and they confirmed their boxes contained used books (I’ll dig up the a title or two if there was anything notable). This is completely off topic and perhaps this happens from time to time so maybe no surprise to the PPM but I noticed part of your review for Steve Strange & Steven Jones is on the back cover of the February 2018 issue of Classic Pop magazine. Dave Myrvold – Yeah, commenter SimonH alerted me to that fact and when I mentioned it to my wife she said we had to buy that copy. She called up the local hip newsstand but the Feb issue wasn’t in yet. As I suspected, an import mag like that sells for $13.95 – ouch! The price of fame, I guess. Thanks for the reminder. It’s two weeks later and I had forgotten all about it. Maybe next payday. The only Go-Betweens CD that I have is the 1978-1990 compilation that came out on Capitol. “Streets of Your Town” should have been @ least a big UK hit & “Draining the Pool for You” reminds me of “Sunny Afternoon” era Kinks. As for the value of CDs, I have a few OOP box sets that has probably have more value than CD interest rates the past decade or so. diskojoe – I need that compilation if I ever want to get those early indie single. I have some incredibly valuable CDs but living in Florida saw many of the booklets develop mildew as I tried to open my windows and not be a slave to the air conditioning. I have lived for 17 years in the mountains in the woods, and the climate here is actually rainforest and that has not helped on the mildew issue either! It kills me when a $200 CD I may have to sell when in desperate need of cash in my dotage is in less than pristine condition simply because I want some fresh air in the home!